Yummy desert that is easy to whip up and take with you to a party! Boil 1 cup of water. While the water is boiling take a straw and begin to poke holes through the angel food cake. Once the water has been brought to a boil add in your jello, stirring well. You want to dissolve the jello. Add in a half cup of cold water and continue to stir. Next, carefully pour the hot jello water over the top of the food cake. Ensuring you coat the top of the angel food cake. You will probably have some left over and that is just fine! Pour any extra into a bowl and set in the fridge for a couple hours and you'll have yourself some jello...or make jello shots, it's your choice! 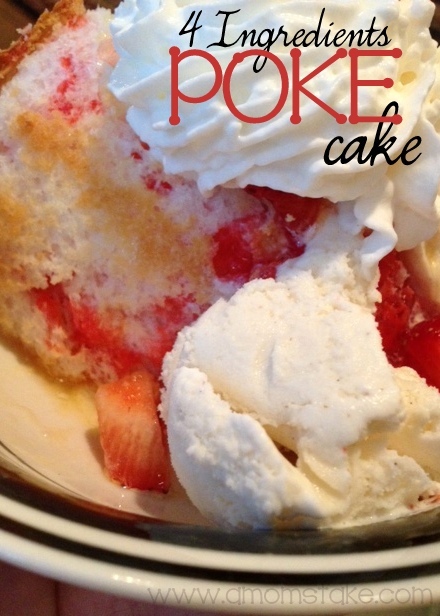 Place the Angel Food Poke Cake in the fridge for 4-5 hours. Let the jello set up. Place the strawberries in a separate bowl with the orange juice and let marinate in the fridge. Serve by plating the poke cake first and then drizzle with the strawberry and OJ mixture on top of the cake. Top with a dab of cool whip or Redd-Whip and enjoy!